Shop the entire Sarah Horowitz perfume range here! I rarely fall totally in love with a fragrance. There's so many of them out there and I'm always trying to find one that really captures my personality, taste and style. I've found a few over the years but Sarah Horowitz Coconut Milk has really captured my heart. This is her most recent fragrance addition to the range and as soon as I heard 'coconut' in the description my heart soared because to me, the beach and summer is my total happiness and anything that reminds me of it has my vote…and money. 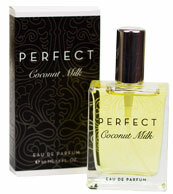 The Coconut Milk scent comes in a roll on Perfume Oil form or an Eau de Parfum Spray. You're instantly transported to your own favorite paradise with notes of coconut, almond, orange blossom, gardenia and tonk a bean! Next Next post: Kai Shampoo and Conditioner!